Hand carved Sterling silver pendant inspired by the many star fish on the rocks down by the shore on Raasay. The pendant hangs on a long 24″ silver chain which it’s a beautiful piece of jewellery in it’s own right. Your pendant will arrive in it’s own eco friendly, branded Silver Grasshopper gift box, send to you with lots of love from Raasay. 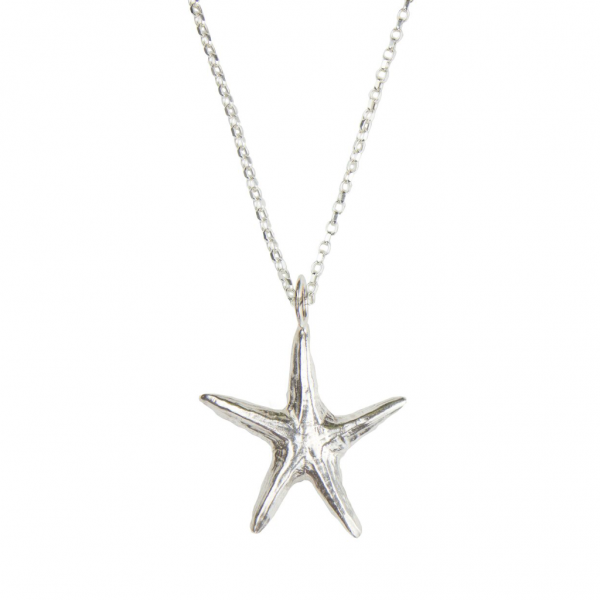 Star roughly 3cm x 4cm and hangs on a beautiful Sterling silver 24″ chain. Got this pendant from my husband for Christmas after dropping some heavy hints! The pendant has a lovely weight to it and the extra long chain makes it a little different – the chain itself is also lovely and feels good quality. I always get complimented on it and would not hesitate to recommend it, its a lovely solid piece. Excellent workmanship and value for money. Service first class, and received pendant via registered mail within two days.